NOW UNDER CONSTRUCTION! This exceptional Soft Contemporary-styled home, 5,216 square feet w/ four bedrooms and office, in Desert Mountain (*) in North Scottsdale. Materials and finishes similar to Saguaro Forest. Completion May 2019. 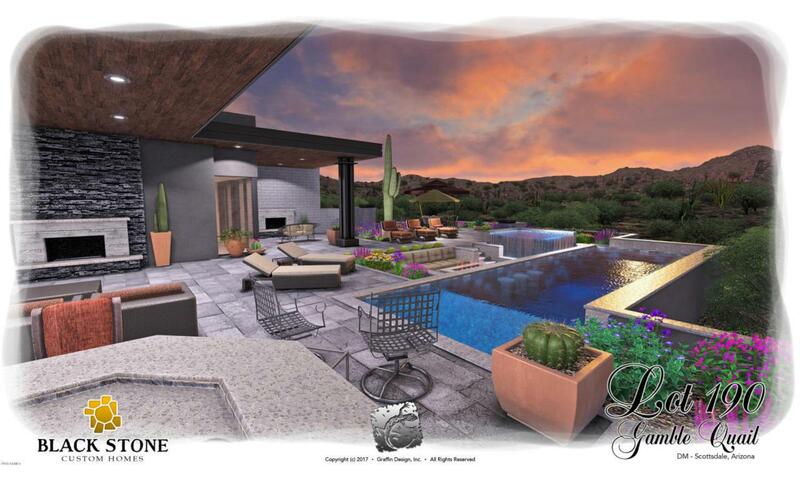 Being built by Black Stone Development and designed by Beau Graffin. 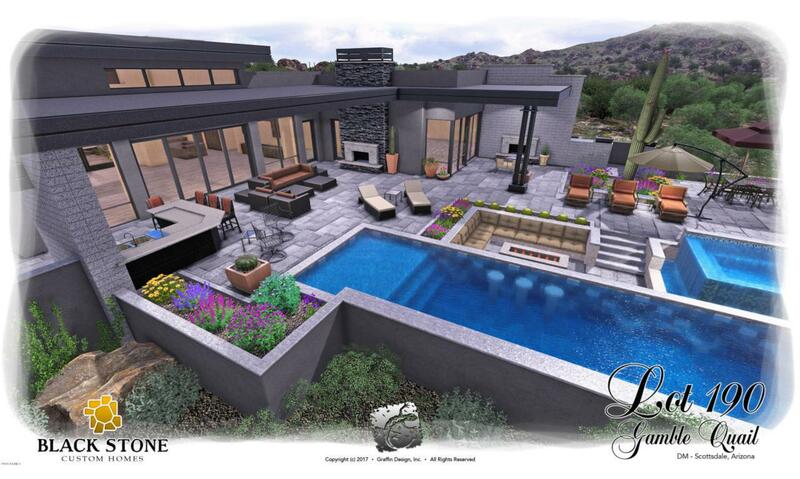 This team has designed and built over a dozen luxury homes in Desert Mountain. The home will have all the ''right'' timeless materials, finishes and features normally found only in custom homes designed by their owners at far greater expense. Of interest is the use of more than a half dozen varied materials and textures on the exterior of the house, including genuine stone veneer, steel fascia, premium ''Ground Face'' architectural (please see ''More'' for further details...)masonry units, steel columns, synthetic smooth stucco, and board form concrete, all of which will combine to create great texture on the exterior of the home. 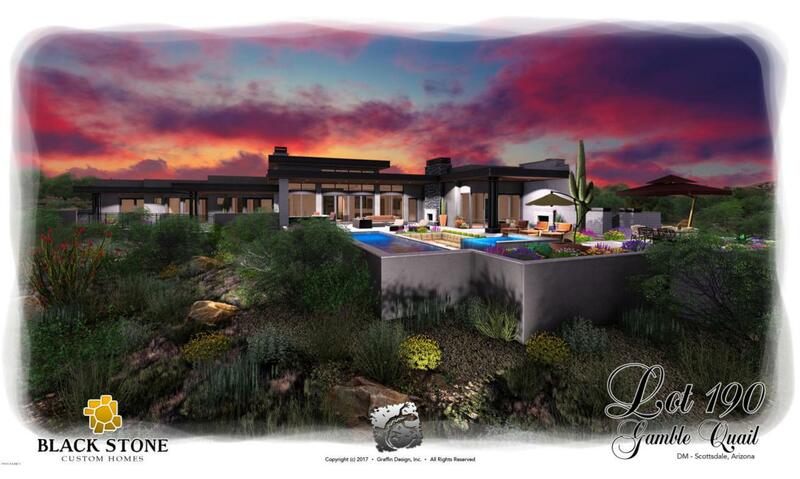 Most homes in the lower areas of Desert Mountain have simple stucco exteriors. This home will be much more interesting to look at. (See the "Notes" in the Documents section for further details). Among many other things, the home features: A open "Great Room" floor plan; no interior steps; two, two-car garages; a large pool and separate spa; an "easy to live with" northern exposure with the pool situated to receive morning light in the winter; excellent mountain views; and especially close proximity to Desert Mountain's Front Gate, the Desert Mountain Club's Renegade golf facility, and the Club's fabulous swim, tennis, fitness and spa facility, the Sonoran Clubhouse (see below for more details). Act before construction starts and influence material and finish selections within generous allowances. (Since final materials and finishes have not been selected, and since a buyer still has time to influence these decisions, there are no photographs of specific interior finishes. They will be included when selected). Membership in the Desert Mountain Club is not included, but available from the Club upon application. 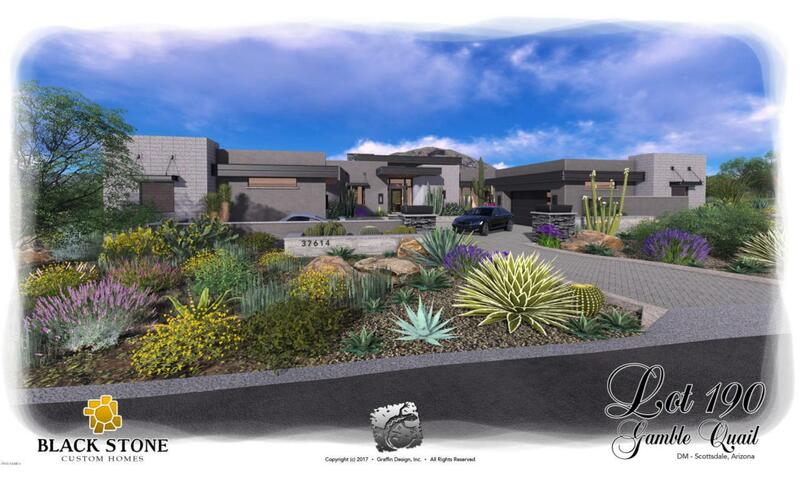 * Desert Mountain is a twenty-eight-year-old, 8,200 acre, nationally recognized, gated recreational community located in far north Scottsdale, about a fifty-minute drive from Phoenix Sky Harbor Airport. In addition to a very comfortable year 'round climate, clean air, a fifteen-mile private trail system for property owners (see below), and the protection of a vigilant HOA with rigorous Design Guidelines, living in Desert Mountain also provides very convenient access to the facilities of The Desert Mountain Club, a private club owned and governed by its Members, with a long list of amenities including six Jack Nicklaus Signature Golf Courses (along with four very well-designed golf practice ranges), six clubhouses with eight restaurants, one of the best golf performance centers in the country for swing analysis, lessons, club fitting, and repairs. Membership in the Club is not included in the purchase price but is available upon successful application to the Club. A variety of membership plans are available. The Sonoran Clubhouse is the Club's swim, tennis, fitness and spa facility. A $12,000,000 expansion and renovation of that facility was completed in October 2016 to much acclaim. Since then, six pickleball courts have been added, along with a golf croquet court and a bocce ball court. It is now a remarkable amenity, adding tremendous value and enjoyment to the community's Club Members, be they residents or not. The previously mentioned trail system is located at the back of the community, in and on top of the Continental Mountains, providing remarkable hiking and mountain biking opportunities for all Desert Mountain property owners. (The Club operates luxury camping and horseback riding operations in the area, too, for extra fun). The trail system is on land that abuts the Tonto National Forest, second largest in the United States, and rises to close to 5,000', providing opportunities for great exercise, comradery with friends and family, and astonishing views many miles in all directions. Desert Mountain is in the foothills of the Continental Mountains in north Scottsdale. The nearby towns of Carefree and Cave Creek provide most of the shopping Desert Mountain residents need within about a ten-minute drive of the Front Gate. Over the years, Desert Mountain has attracted people from all over the United States and Canada, plus a few from the UK and Germany. It is an extraordinarily notable community of its type, if not unique in the entire United States, and deserves thorough evaluation by anyone looking for a gated community lifestyle in Arizona. For further information, please see the Club-related links in the Documents section. The Floor Plan and a map showing the home's location in Desert Mountain are in the Documents section, too. Hoa Name Dsrt. Mnt. Mstr. As.